Pete Tackett is a self-confessed broken man who has been the recipient of amazing grace, healing, and restoration. Pastoring a 2,000 member church, he crashed and burned in a spectacular way in 2009. His wife, Lori, and his church family stood by him, even though he resigned as pastor. Click on the Journey tab above to read see the whole story. After a year in which in his own words, he “did not preach, teach a class, or pray a public prayer after a lifetime of full-throttle ministry,” Pete was restored physically, emotionally, and spiritually. In the fall of 2010, he and Lori returned to vocational ministry, becoming pastor at Antioch Church in Johnson City, Tennessee. Pete was the recipient of much help that had to do with the size of his network and the size of his church. Yet, he quickly discovered there was almost nothing in place to help him put the pieces back together. In the four years since, he has met with and ministered to nearly 100 pastors who have suffered moral failure; been forced out of a church; or are dealing with emotional illness. As much as he can, he helps them connect with some of the resources he found and assists their churches in setting up a restoration team to help them in the journey. This site is the front door that allows men struggling with ministry burnout and failure to connect with Pete and Lori. 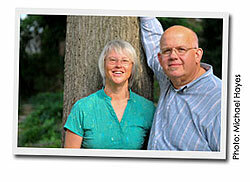 If you or someone you know would benefit from a conversation with the Tackett’s, contact us. There is never a cost. This is our way of giving back to a God who showered more grace and mercy on us than we believed possible.